It’s been a great year for property. Not only have we had some fabulous houses for sale in Leicester, but Leicester house prices have been on the up too. This all comes despite the looming figure of Brexit which left many concerned for a detrimental effect on the market. In 2017, the East Midlands did well, with house prices rising at more than three times the pace of London in the past year. According to the Office for National Statistics (ONS) property prices in the region rose by 7% in the year to October – the fastest in the UK. Not only that, our East Midlands region, which includes Nottingham, Derby and Leicester, again saw rents rise fastest, going up by 2.7%. According to Rightmove, the majority of sales in Leicester during the last year were semi-detached properties, selling for an average price of £185,143. Terraced properties sold for an average of £154,380, with detached properties fetching £305,312. Leicester, with an overall average price of £197,703, was more expensive than nearby Aylestone (£149,377) but was cheaper than Clarendon Park (£228,446) and Stoneygate (£271,350). Overall sold prices in Leicester over the last year were 4% up on the previous year and 18% up on the 2014 level of £167,236. When the announcement was first made about Brexit, many feared disastrous implications for the British economy, which included a big hit to the housing market. However, as times have moved on and the wheels have got in motion, more and more people are forecasting steady results, especially for areas outside of London, such as the East Midlands, East of England and the North West. According to professional services firm PricewaterhouseCooper (PwC), we will see average UK house prices rise by an annual four per cent a year until 2025. Other, slightly less exuberant companies think prices will remain flat with Brexit, stamp duty and political uncertainty taking its toll on the market. 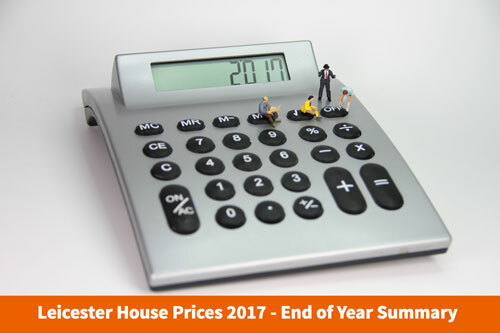 The general consensus is that price rises will remain muted overall next year or there will be a rise that is smaller than in other years. But a rise, nonetheless. When it comes to buying and selling a property, we must always remember that much of the driving factor is that people need to move house at the time, because of their job, or their family size is changing. And this will always happen, whatever is going on in the world of politics. Demand for housing still remains high too, so this, in turn, will keep prices on an upward motion (albeit a slightly slower one). Reassuringly, there has been little to no comment that Brexit will cause a sudden fall in the price of a property, which is excellent news for people looking to sell and move on to somewhere new in 2018. If you are looking to buy or sell a property in Leicester, then it always pays to find an agent with a wealth of experience, truly good knowledge of the local area, its house prices and the housing market in general. You can even receive a free instant online valuation right now. It also helps that they know the kind of things that makes properties appealing to the buyers in the area, in order to help you achieve the best possible price. At Readings, we take pride in being able to offer an estate agency that can give you just that. If you have any questions to ask, or would like to enquire about buying or selling a property, get in touch with one of our experts today.